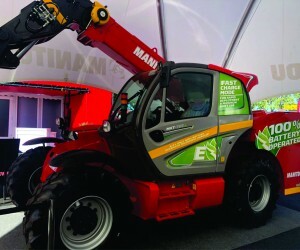 Battery Power Industries (BPI), battery driven mining vehicle specialists, provided the battery drive system for Manitou Southern Africa’s first electric telehandler. Manitou’s battery driven telehandler, the first of its kind, was unveiled at Electra Mining Africa 2018. BPI designed and implemented the conversion of the telehandler from a diesel driven system to a fully electric system utilising Lithium Ion battery technology. BPI, a proudly South African OEM specialising in the development of battery energy systems, electrical traction systems and high speed charging systems for underground mining equipment, was launched in 2018. The MHT-790E electric telescopic handler has a lifting capacity of up to 9 tons and a lifting height of up to 6.84m. The machine is powered by a LiFePO4 (Lithium Iron Phosphate) battery, known to be one of the safest battery chemistry compositions for its thermal and chemical stability. According to Coetzee, the additional advantages of using this type of battery include its low cost, non-toxicity, the natural abundance of iron, safety characteristics and electrochemical performance. “In the MHT-790E electric telescopic handler all of these advantages culminate into a machine with zero emissions and far less heat being produced which protects the health and safety of those working in confined areas such as tunnels and mines. It also has a long battery life expectancy of 3,000 cycles and continuous battery shift time of 8 hours combined a high speed charging time of 90 minutes or on-board charging time of 8 hours to ensure an uninterrupted work shift,” Coetzee adds. BPI’s system addresses mining ventilation as well. The heat produced by machinery working underground puts pressure on ventilation systems resulting in additional costs for system upgrades. “Due to the fact that it emits far less heat than a conventional diesel driven machine, the MHT-790E does not put pressure on these systems, resulting in savings on fuel needed to support ventilation as well as savings in upgrade costs,” Coetzee explains. This was achieved with the machine’s built-in active air-cooling system which is completely sealed and cools the air down to keep the battery temperature at optimum levels while the electric motor is cooled via a water cooling method. This system is part of BPI’s ultra-safe design approach to all systems. Additional safety features built into the MHT-790E telehandler include various Detection Systems, ensuring that the vehicle slows down should a person, vehicle or obstacle be detected, thus reducing the possibility of accidents. The battery pack included in the MHT-790E is also 3G impact rated, protecting it in the unlikely event of an accident. An Automatic Fire Detection and Suppression system specifically designed for Lithium Ion battery systems also forms part of the system allowing for the detection and protection of any electrical sparks and smoke, or short circuit overload that may occur. “BPI’s main objective is to remove all emissions and harmful equipment from use in mining operations as part of our innovation-led approach to sustainable mining. This approach involves the application of cutting edge technology to address mining’s major challenges. We firmly believe that our designs are able to outperform traditional diesel-fuelled vehicles on the market and achieve considerable energy cost savings and lower overall machine costs. 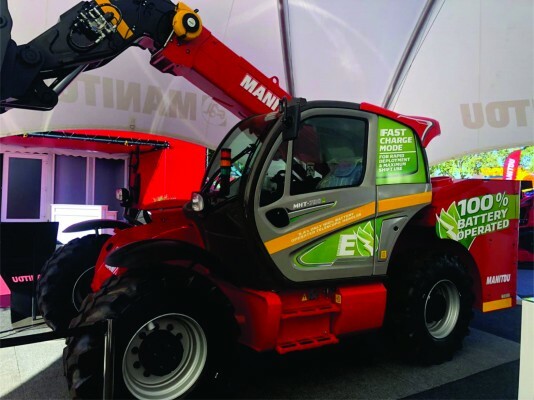 The launch of the Manitou’s MHT-790E electric telehandler affords us the opportunity to have the return of investment on our electric vehicle systems field proven,” says Coetzee. According to Manitou, the MHT-790E electric telehandler offers a return on investment over a short period of just 2-4 years. “Savings on fuel, possible fuel rebates and reduced maintenance costs, as opposed to maintenance on a diesel powered vehicle, all contribute to the cost effectiveness of the machine. The estimated running cost of the MHT-790E is 32% of a diesel equivalent which, combined with the multi-functionality of a telescopic handler and an array of available attachments, is a truly cost effective solution for the mining and construction industries,” states Manitou Southern Africa. BPI’s team was challenged with a turnaround time of just 3 months to complete the project – from conceptualization through to design, procurement, manufacturing construction, assembly and finally commissioning. “The fact the project was completed, successfully, within the time constraints is due to the absolute commitment from all stakeholders and role players involved,” says SP De Bruyn, Head of Mechanical Engineering at BPI and lead on this project. “This includes the flexibility, technical capability and can-do attitude of Manitou Southern Africa and their aftermarket team, as well as the technical capabilities and expertise that the BPI team has built up over the last four years. The first MHT-790E electric telehandler was purchased by mining infrastructure construction firm, TDS Projects Construction who will be using it in their underground operations. “TDS is committed to improving health and safety conditions in the workspace for their employees and this was their motivation for purchasing the vehicle,” says De Bruyn. Manitou’s MHT-790E electric telehandler will be distributed through Manitou Southern Africa’s extensive network of 12 dealers throughout South Africa and neighbouring countries, and through the Manitou Centre in the Western Cape, who distribute and service Manitou products.